A Spokane Regional Health District staff member says rabies is usually fatal and only a couple of people have survived the disease. The last thing you want to do is come in contact with a rabid bat. But Spokane Regional Health District staff said you may have to do more than that if you find one in your home. Many people call into the Spokane Regional Health District two to three times a week regarding human or pet contact with bats. Spokane Regional Health District staff said you should not panic but you should definitely take this seriously. According to SRHD staff, finding a bat inside your home during this time of year is not uncommon at all. In fact, this is the case with most people calling in about bats, staff members said. "We are really concerned when that happens because if you've been sleeping and your door has been open to your bedroom, it could have contacted you and you might not know because they have very small teeth, very small claws," said Sandra Phillips, an environmental public health officer with SRHD. "Rabies is pretty much always a fatal disease. There have only been a couple of people that have survived." Many of you let us know on the KREM 2 Facebook page that you have had a scare of your own. One viewer wrote, "One got in our room the other night through a very small crack around our window air conditioner unit. We spent an hour trying to capture it in a laundry bucket and then released it outside." Another viewer wrote, "Several years [ago], I had one in my bedroom. I was scared to death. My husband knocked it out with a fly swatter and took it outside." SRHD staff said the first thing you need to do if your find a bat inside your home - or you or your pet have had physical contact with one at all - is catch the bat so it can be sent in for rabies testing. The health district recommends you put screens on doors or windows if you leave them open in the summer to prevent contact with bats. You should also be sure to close pet doors at night and that any openings - regardless of size - are closed. 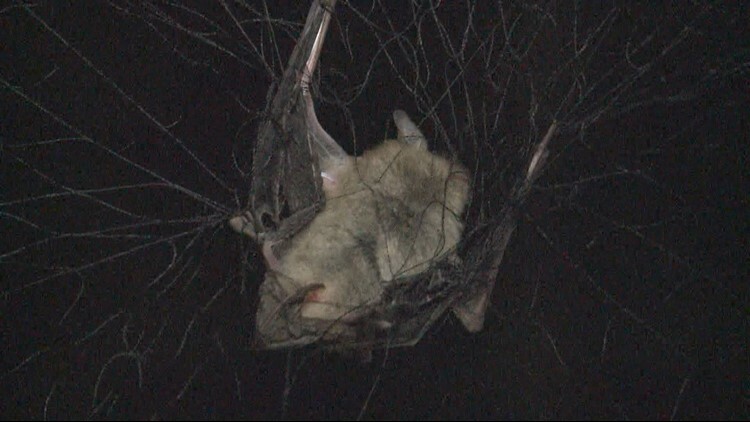 Last year, 33 bats were shipped out of Spokane County to be tested for rabies and at least 2 came back positive. There have been human deaths due to rabies in the state. Although this is not common, it is possible. According to the Pandhandle Health District, there were 22 cases of post-exposure rabies last year. No human cases of rabies have been reported in North Idaho. If you have any questions or concerns at all, you can call the Spokane Regional Health District at (509) 324-1500. You can also check for numerous capture and bat safety tips with the district's BatSmart program.